I recently started using Influenster. It is a social influence tool that allows you to try new products! I got a sample of Aveeno Posivitely Radiant Intensive Night Cream. And I love what its doing to my skin! 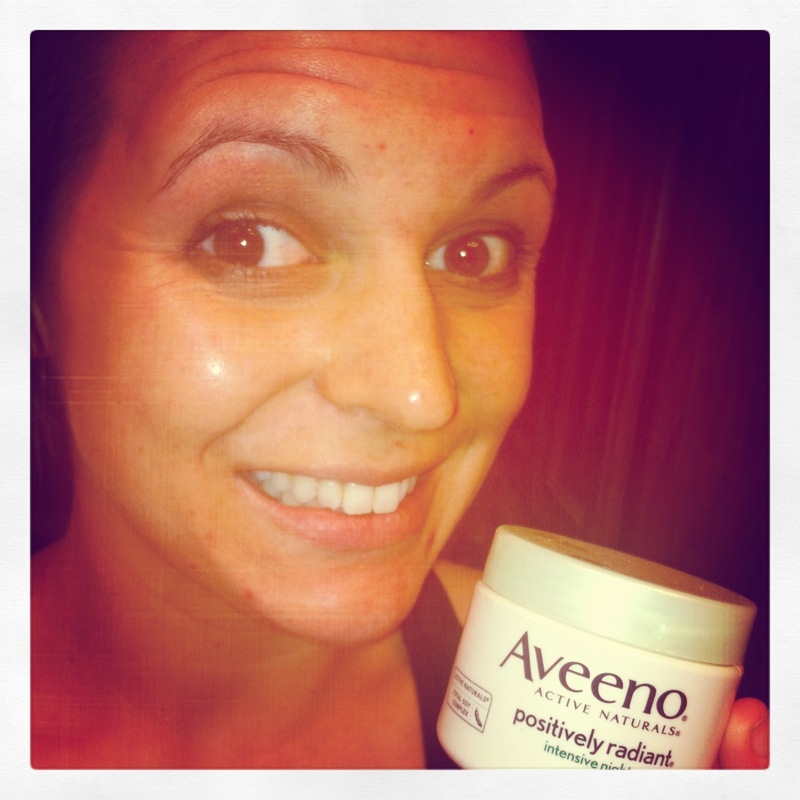 While I blog about Aveeno’s Positively Radiant, I wanted to walk you through my nighttime routine. I was my face, use a rosacea wash, and then remove my eye makeup. I typically use a gel moisturizer, but I have been alternating every other night with the Aveeno Positively Radiant Night Cream. At first, I was using it daily, and I think it inflamed my rosacea a bit. So I started alternating it, and I saw the results of smoother, more radiant skin without the inflammation. The Aveeno Positively Radiant cream helps reduce discoloration, uneven tone, and blotchiness – and I’m seeing a change! Smoother skin, a little “glow,” and less splotchiness. I like it! I’ve done the influenster as well but have yet to receive anything and not sure how to. I just fill out the surveys when they send them….not sure what else to do! Good luck! Yes, I have to be careful what I use on my face as well. (rosacea girl, too) I use my prescribed face wash from my Derm once per day and I use a gentle one from Mary Kay at night, along with the TimeWise night serum and moisturizer. Your skin looks great, sista! What is your face wash? For rosacea? I need something like that. I HATED the cream and pills I got! Brittney I love the aveeno line soooo much but if you decide it isn’t working for you as Cristi said the Mary Kay line Time Wise is amazing! And I just happen to be a Mary Kay consultant :). Let me know if you would like to try some samples. Id be happy to either meet up with you and do a facial or mail you some samples to try!!!!! Britt, my Derm prescribes an oral pill for really bad flareups, that I normally don’t need. But the prescribed facewash he has me on is one by Acella Pharmaceuticals and is “Sodium Sulfacetamide- 10% Sulfur- 5%” It works awesome for me. Not the greatest smell when applying, but it works wonders! Doesn’t clog my pores either!